We learn by doing. More specifically, we learn by being taught, then practicing a skill or concept, receiving feedback on our progress to correct errors and reinforce what we are doing well, and finally continuing on our own once we are proficient. While this is familiar to most teachers, the question of how much and what type of feedback is sometimes unknown or doubted. "Good job!" "Excellent Work!" "Way to go!" All of these phrases are commonly heard in schools. Yet these empty phrases do not provide students with the information they need to reflect upon what they have done well, what their strengths are, the errors they have committed and what they need to do to improve. John Hattie discusses four types of feedback that are given to students. The first, the "self" level, is what was just described. The feedback, often in the form of praise, directs students away from the task itself and back towards the self. This type of feedback contains little to no information related to the task. While some students may enjoy hearing some of this feedback, more effective feedback is instructional in nature and relates to the task at hand. What type of feedback should we provide to English learners? When thinking about the feedback you will give students, consider first the objectives of your lesson. Providing students with objectives at the beginning of a lesson is a helpful way to focus attention on what the teacher expects students to learn, and gives students direction as to what they are working toward. When working with English learners, numerous researchers have advocated for providing both content or learning objectives as well as language/communication objectives. When English learners are clear on the content they are to learn as well as the language skills they will be working on, they can more easily focus on these areas without being overwhelmed by the content and language being presented to them in a new language. Objectives also provide clarity as to what students will be given feedback on. This is helpful to both the teacher and the student as there are often multiple areas of potential feedback. Errors in content may be related to past learning or current concepts. Language errors may relate to any number of grammatical concepts, vocabulary, usage, and more. While all of the errors may need to be addressed at some point, by setting objectives and focusing our feedback on those specific topics, we allow students to be mindful of the areas they will be focusing on and not become overwhelmed with the amount and content of the feedback provided. Language or communication objectives can and should be based on the state English Language Proficiency Standards. As teachers gain familiarity with the standards and the English proficiency levels of their students, they can tailor the objectives, instruction and feedback to the students in their classes. This level of individualization, while challenging, will help students make the most gains in terms of language proficiency. Feedback provided to students can be described as evaluative or descriptive in nature. Evaluative feedback provides learners with a judgment of the quality of the learning. Phrases such as "This is great! ", "You need to work on this more", or "Your writing has improved" all provide an evaluation of the student's performance, but do not provide meaningful feedback on what students can do to improve their performance. Descriptive feedback, on the other hand, provides students with specific information based on their performance in making progress towards meeting the learning or communication objectives. Descriptive feedback is meant to help learners understand their strengths and areas of needed development. Many teachers have long grappled with providing feedback on content and are comfortable doing so. When it comes to errors English learners make, few teachers have received the training needed to determine what type of feedback is appropriate. A common belief is that if students are making errors in their speech or writing, those errors should be corrected immediately so that students understand the errors they are making. While this holds some truth, research has shown that error correction is inconsistent, unclear and overemphasizes the negative. Correcting English learners' language errors is a crucial step in helping students develop English proficiency. Feedback provided to students must be comprehensible, useful and relevant to them and the task at hand. Research has pointed out that modeling correct grammar by restating is most effective. Other researchers have pointed out that providing feedback to students on the accuracy of their language concluded that it is beneficial and enduring in its impact. When should we provide feedback to English learners? How and when teachers provide feedback may be a deciding factor on how students are able to take in the feedback and act upon it. 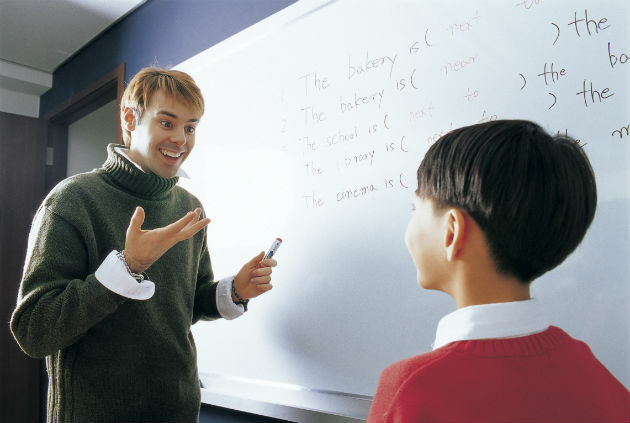 Conferencing and direct instruction on common errors as well as topics covered in the English Language Proficiency Standards provided by the classroom teacher or by an English language development specialist benefit students in gaining language proficiency. Students can be provided with direct, corrective feedback by restating and modeling correct grammar, or by providing a direct correction in a discreet manner. Feedback should be provided in a timely manner, whether it is provided orally or in writing. Students should be able to act upon the feedback and begin to correct the errors they are making. The Collins Writing Program provides an effective way to provide feedback to students on their writing. Through the use of focus correction areas (FCAs), teachers make clear the expectation for student writing, including content and linguistic features. The writing is then corrected based on the FCAs, and students are provided feedback on just those points. FCAs can be targeted to English learners' proficiency levels as well as targeted to the skills being worked on in the content area. Teachers should take into consideration students' age, proficiency level and the type of feedback they will provide — including oral feedback, written feedback and the instruction the students will receive in small groups or in an English Language Development class. How much feedback should we provide to English learners? When providing feedback, how much is too much, and how little is too little? This is a challenging question to address. Essentially, students should be given the maximum amount of feedback that they can act upon to improve their performance. Just as when providing scaffolding, the Goldilocks principle should be employed: not too much, not too little, but just the right amount. The exact amount will be determined by a number of factors, especially the students themselves. As mentioned before, the objectives for the lesson should serve as a guide for providing feedback to students. Past topics covered can also be included, but feedback on topics not yet taught to students should be limited. Providing feedback benefits students as they learn content concepts, skills and academic language in school. The challenges of what specific feedback to provide to students, when to provide feedback, and the amount of feedback to provide are not easy to master. With a continual focus on providing effective feedback, we can help students on their journey of learning.